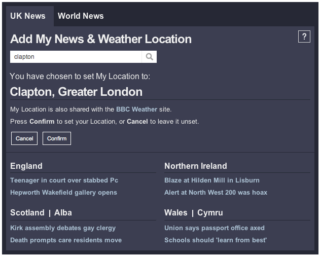 Enabling BBC News and Weather users to set a shared location setting. My BBC Location is a standard for sharing a site visitor's location preference to offer geographic information that's relevant to them. I defined an extensible cookie format to enable different granularities of location to be passed around. For example 'BBC Local regions' or BBC Weather forecast locations. This feature is currently used to personalise the BBC News frontpage and BBC Weather site. Extending to other BBC sites is planned.